As the sun set behind Mead Chapel, graduates prepared for the processional. MIDDLEBURY, Vt. — The Middlebury Language Schools conferred 136 Master of Arts degrees and three Doctor of Modern Languages degrees at its 98th commencement on Aug. 17 in Mead Memorial Chapel. The 16th president of Middlebury College, Ronald D. Liebowitz, and the directors of the Language Schools presented the master’s degrees for study in Chinese, French, German, Italian, Mediterranean Studies, Russian and Spanish, and the doctoral degrees to the candidates who completed advanced study in two foreign languages. 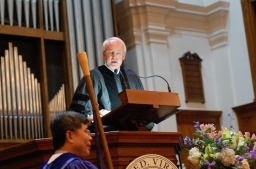 John Beyrle, the U.S. ambassador to the Russian Federation from June 2008 through January 2012, delivered the commencement address to the gathering of graduates, family members, faculty and guests. 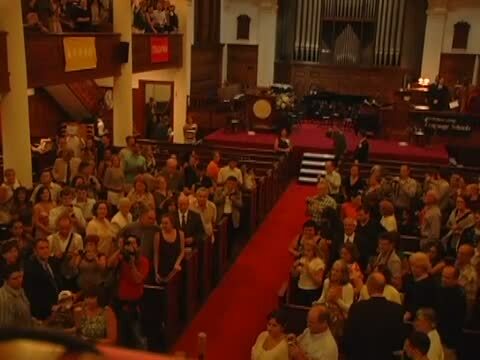 As a former student in the Russian School, Beyrle opened his address by commenting on how strange it feels to be speaking English on the Middlebury campus where, he remarked, the Language Pledge is always in force during the summer. Quoting Nelson Mandela, he said, “If you talk to man in a language he understands, that goes to his head. But if you speak to a man in his own language, that goes to his heart.” During his 29 years with the State Department, Beyrle has held policy positions and foreign assignments in central and eastern Europe, Russia and the former Soviet Union. Ambassador Beyrle delivered the commencement address. The ambassador concluded with five pieces of “practical advice” for the graduates. First, “stay focused on one or two languages that really move you and make their mastery a lifelong experience.” Next, “go away. Get out of here. Choose study abroad that gets you so far out there that you don’t hear, speak or even see English for days at a time.” Third, “rediscover radio…if you want to learn to talk to people, the main input is what you hear. And so today it is a simple matter to stream” the foreign language that interests you. Following the address, the college conferred academic degrees upon its newest graduates and an Honorary Doctor of Laws upon Beyrle in recognition of his service to his country and to the cause of international peace and understanding. President Liebowitz opened the ceremony by examining the history of Middlebury College and by acknowledging the contributions of five people in particular: Gamaliel Painter, one of the founding fathers of both the town and the college; Lilian Stroebe, who started the first language school at Middlebury, the German School, in 1915; Professor Stephen A. Freeman, who served the college and the Language Schools from 1925 to 1963; Betty Ashbury Jones, graduate of the French School, supporter of the Language Schools and trustee emerita of the college; and Kathryn Wasserman Davis, the 105-year-old philanthropist and renowned champion of international peace. Master's degree candidates gathered at Mead Chapel for Friday night's commencement. Michael E. Geisler, vice president for Language Schools, Schools Abroad and Graduate Programs, welcomed all to the ceremony. "This year over 1,500 students attended the Middlebury Language Schools here in Vermont and at our second site in California," he said, "with almost 1,000 of them coming not to earn a degree, but just to study language. To learn to talk like people from another culture, joke like people from another culture and even argue as people argue ln another culture. "In doing so each and every one of them, just as our graduates have done tonight, risks not just failure and embarrassment but far more. [Language Schools students] risk their identity; they risk their sense of self…In no other academic discipline that I can think of do you put the very core of your being on the line, for yourself and for the world as you know it. For having the courage to do that, I salute you." After two musical interludes presented by students of the Language Schools, the ceremony concluded with the singing of "Gamaliel Painter's Cane," led by François Clemmons, the Twilight artist-in-residence. 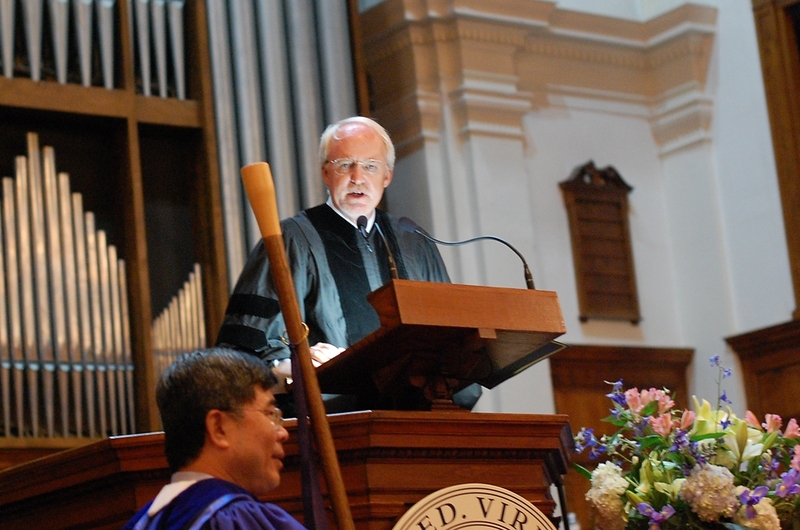 The graduates and guests then rose and marched into the Vermont night led by marshals Jianhua Bai and Antonio Vitti, directors of the Chinese and Italian Schools, respectively, as Emory Fanning, professor emeritus of music, played the recessional on the organ.